This week has been a funny week. 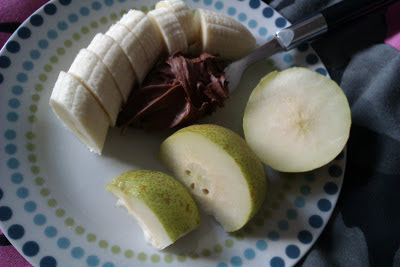 I'm beginning to work out what foods sit well with me and what foods absolutely hate me! There's a few I am realising. It's all about trial and error at the moment. Thanks to Jenn for hosting. It's one of my favourite blogger link-ups, and I enjoy reading everyone else's posts too. I don't have much to share this week as I've had some of the same foods you see more than once or similar meals, and so I don't want to bore you with replicas. Small banana with the best tasting strawberries I've had in a while + a dollop of Nutella. I can't stop going on about these strawberries this week. They were so naturally sweet. I may have to go buy more. My friend who doesn't like strawberries admitted they looked good. I know she hates strawberries! I couldn't believe it when she told me, she says its the texture of the outside more than anything. Strawberries remind me of being at my nan's house as a child, having a bowl with sugar (like they needed sweetening!) and a tonne of whip cream. 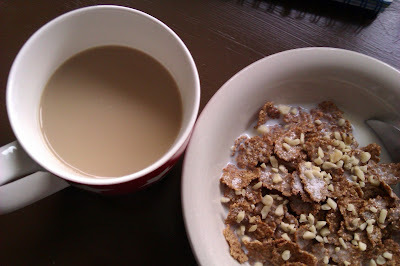 Bran Flakes w/ chopped nuts and semi-skim milk. The other day I went shopping and I was looking for a cold cereal. Does everyone know what I mean by that or am I alone on a ship? Basically I put cereal into two categories; cold and hot. Cold being I have them with cold milk and hot being the opposite. I think I've been saying it like that as far back as I can remember. Anyways, I was shopping and saw this women buying bran flakes. Actually, she was struggling to get them down so I helped and it inspired me to go back to one of my favourite cereals. Much love for Bran Flakes. I love them with many toppings! Southern Fried Chicken w/ Wholewheat Pasta and Salad. I love chicken, especially flavoured or spiced chicken. I realise it's not the healthiest but I fancied it last week and so got a four pack to freeze and eat when I craved thinking they'd last ages. :-( I have one left. Utter fail! But they were so damn tasty. I've recently fell back in love with hot coffee. For ages I'd only drink Iced Lattes from Costa, but lately I have converted back. But I don't know if I am ready to commit because when I was drinking it last week I was getting headaches. Too much caffeine! But so tasty. 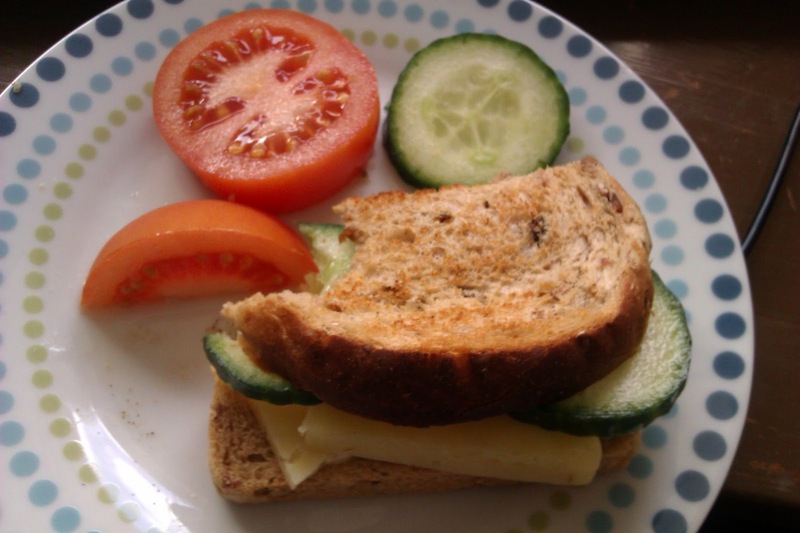 Snack before class: Cheese, cucumber and tomato toasty. When I have a busy day of classes these tosties are perfect to have on the go. Toast w/ margarine and boiled eggs. Last week I kept differing between savoury breakfast options and sweet options depending on what took my fancy. 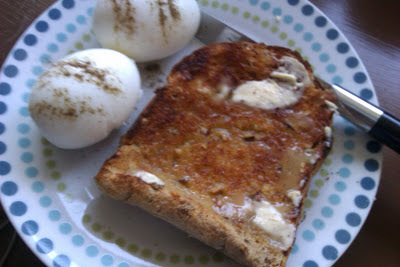 Adding some form of protein to my breakfast definitely keeps me fuller for longer. Pear, small Banana w/ Nutella. 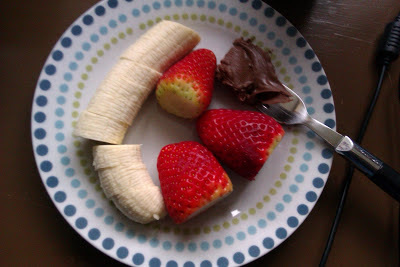 I've been loving my fruit plates on afternoons this week. The pears have been especially good. Curry w/ Rice and Veg. 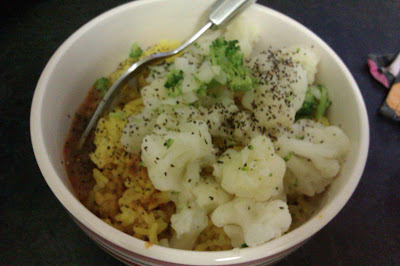 It may be a strange combo but I love having veggies with my curries. My mom would probably give me a dirty look and look at me like a weird child, but I love it. This particular frozen, convenient meal wasn't that good and I won't be having it again. 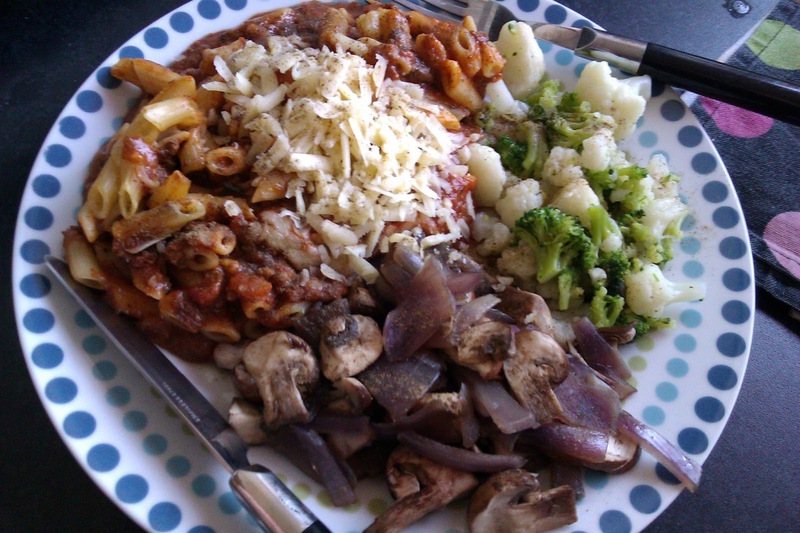 Pasta and Bolognese w/ Cheese, Mushrooms, Red Onion and Veg (Cauli and Brocc). I had this for lunch/dinner last night. Another frozen meal but with all my healthy extras it was so filling. Me and my best friend got back from swimming ( I am so out of shape, hadn't been in years! but will definitely be going back for more) and we were ravished, but I patiently waited and hardly grazed on anything other than a tomato and some cheese. I know random right? Happy Wednesday :D I'm going to try and get even more veggies into my diet this week! 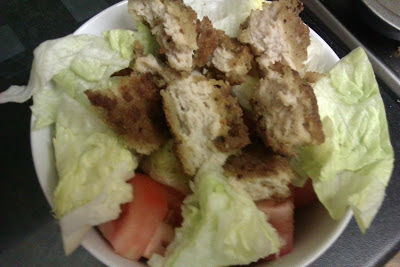 Thank you Peg :D Yes, photographing my food definitely makes me feel more accountable. I love WIAW, it's such a great blogger link-up. Enjoy your week! I totally know what you mean by "hot" vs "cold" cereal. Have people misunderstood you before? 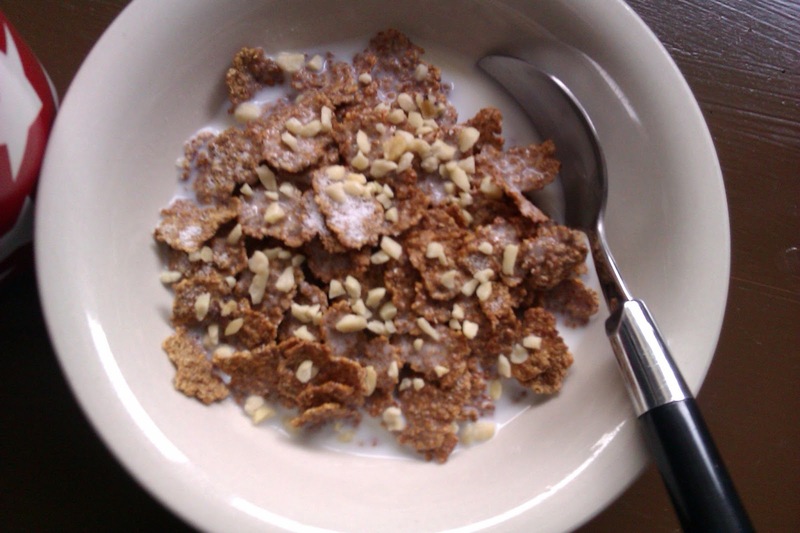 I think of hot cereal as porridge or oatmeal, and cold cereal as frosted flakes or cheerios! I know what you mean about Nutella. I used to avoid it growing up, and I'd never tried it until Christmas when we went to a German market (I live a sheltered life), and they hadn't got my usual so I had to have nutella on my waffles. Now I'm an addict. But if it's not nutella, it's crunchy PB - so I can't really win! Enjoy your week.